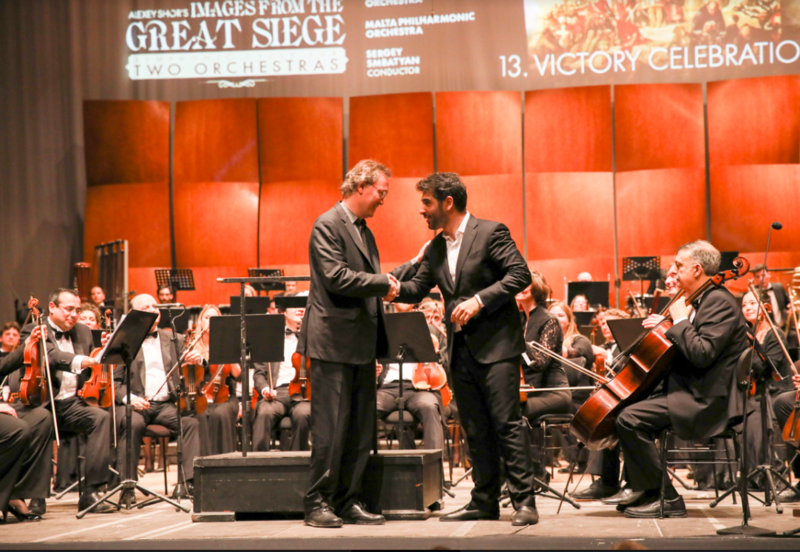 Well, it happened, finally: at the 6th edition of the Malta International Music Festival we attended the world premiere of Alexey Shor’s symphonic cycle “Images from the Great Siege”, dedicated to the heroic defense of the island in 1565, when the Ottoman Empire unsuccessfully tried to defeat the Knights of St. John. SVETLANA VELLA, Editor-in-chief of the Maltese Herald magazine and LINA GONCHARSKY, music critic exchange their opinions on the event. Lina Goncharsky: Definitely, tandem is the right conclusion and there is another reason for it: when I asked the composer why he decided to unite two orchestras, Alexey Shor said that he did not actually mean opposing one of them to the other, although we are talking about two sides in arms — the Maltese and the Turks. That is a handful of Knights Hospitallers, aka Knights of St. John, a couple of thousand of the Maltese militia and small units of allied troops, who stood before the onslaught of the huge army of the Ottoman Ports. No, Alexey Shor didn’t want orchestras to fight with each other, on the contrary, he meant united orchestra just the same in the Wagnerian sense, because in order to recreate the pictures of fierce battles, he needed to double the number of musicians. S.V. : Would you please elaborate on Wagner? L.G. : I’ve just remembered how Wagner and Berlioz invented — both of them on their own — quite bold methods of orchestrating, not to mention all sorts of cunning tricks. And Wagner, who was anything but a friend to Berlioz, still recognized the “fantastic courage and extraordinary clarity of the most risky combinations” that Berlioz used in his “Fantastic Symphony” and “Harold in Italy”. As for Richard of Bayreuth himself, the composer was inclined to the “double” orchestral sound: bassoons with French horns, trumpets with trombones, etc. — to perform the melody in octave or unison. Now, in Alexey Shor’s cycle “Images from the Great Siege” we have heard a number of fine examples of winds playing in unison. Other ideas for double orchestra were quite impressive, too. L.G. : Yes, I remember our walk, you’re an amazing storyteller… Therefore, during the premiere, I could easily visualize the musical pictures of Alexey Shor, and it was even more interesting. Not to mention the fact that we are talking about the program cycle — each part has a title. It is also noteworthy that the author approaches historical events from the point of view of a 21st century person, as he noted in his interview. L.G. : Anyway, what happened next? S.V. : Well, in May 1565 — and that date any Maltese person will reproduce correctly being in any physical form, — powerful Turkish fleet under the command of Dragut (or Turgut) Reis, the cunning and treacherous leader of the Berber pirates, anchored at Malta’s shores. The Grand Master of the Knights was certain Jean Parisot de La Valette, fearless and no less cruel person — in short, a worthy opponent to Dragut. The Order’s military forces were much inferior to the Turkish — but not in morale! L.G. : Terrible story, indeed… Fortunately, Alexey Shor spared our nerves and did not paint all this bloody slaughter. Although it sounded powerful. However, large-scale compositions associated with the anniversary in memory of fallen heroes require mass performance. Let us recall at least Berlioz’s “Grande Symphonie funèbre et triomphale” or his “Requiem”, where the orchestra reaches gigantic proportions — the symphony orchestra is enlarged by several military orchestras… Yes, of course, the winds section became oversized, but in this situation, everyone would need trumpets. Berlioz, by the way, was a commander of his own big musical detachment — he was marching in the head of his column and conducted with the sword. S.V. : With a sword, really? That’s an interesting coincidence: in Birgu — where the Fort St. Angelo is situated — there is a chapel of Our Lady of Damascus where La Valette donated his hat and a sword as a token of gratitude for victory over Turks. By the way, the second name of the city of Birgu — Vittoriosa, that is Victorious — was granted after the Siege. But these all happened after. In the meantime, after the Fort St. Elmo was seized, the Turks attacked Fort St. Angelo. The battle was fought on land and at sea, and the main enemy of La Valette, Dragut, lost his life there. His death hit the Turk’s morale, but they didn’t give up and even managed to breach one of the wall of the Fort St. Angelo, however, the fortress was not surrendered thanks to heroism of the Knights and the Maltese as well as the allies who managed to come from Sicily to assist in fighting. And then the Deputy General Hiver intervened (it is a common knowledge that there is no snow in Malta). Early autumn sea storms made the Turks retreat. It happened on September 8, when the Catholics celebrate Nativity of Our Lady, so now you understand La Valette’s ex-voto. It is noteworthy that Malta’s Victory Day is also celebrated on September 8, and in honor of this “double festa” — secular and religious — the local brass bands play triumphal marches in Malta’s towns and villages. S.V. : Besides, there is something else which is very interesting: Shor became the first composer who turned to this episode of Malta’s history. This is despite the fact that Voltaire said, Nothing is better known than the siege of Malta”. L.G. 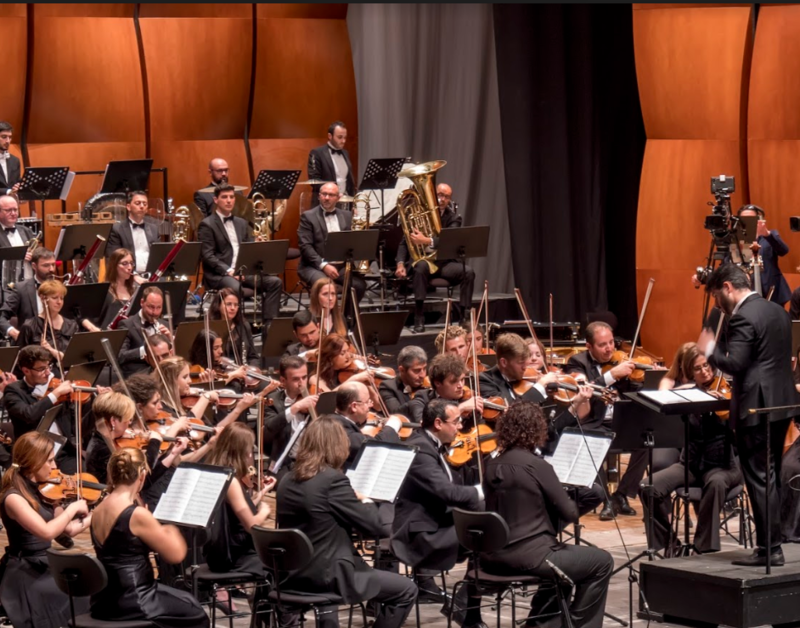 : I would like to emphasize the excellent work of the conductor, Sergey Smbatyan, who was in charge of two orchestras — the Armenian State Symphony Orchestra and the Malta Philharmonic Orchestra. He worked so skillfully, so naturally that I have to quote myself and repeat again that we are talking about a young genius. L.G. : Indeed, we’ve heard this today — in the fantastic fusion of the two orchestras. By the way, after the “Great Siege” cycle they played the pieces from my favorite “Spartacus” Suite by Khachaturian, and to this phenomenon, like the phenomenon reading this opus to the dazzling Sergey Smbatyan, I will dedicate a separate review. It touched me to the bottom of my heart because I remembered a documentary I filmed for the 100th anniversary of Aram Ilyich… But this, again, is another story. As for the subject of our conversation, Alexey Shor once again confirmed that he is a composer of lyrical talent, since even the battle scenes did not prevent him from creating romantic images associated with the battle. And far-from-war episodes like “Young Knight’s Dream,” or “St. Elmo Barcarolle”, or “Grand Master’s Ball”… Perhaps he poeticized the island defenders’ courage, and it’s incredibly touching. Well, if you think that those events happened nearly 500 years ago, it becomes clear that this is a reflection on the event, not the description of the event; musical pictures of battles, born in composer’s imagination. Despite all the “Cannonade”. And despite the terrible bloodshed associated with the Siege, it has a happy ending — the invaders retreated, the defenders saved their land. This reminds me of the battle of David and Goliath, doesn’t it? S.V. : Yes, this is a symbol of victory over the mighty enemy, the victory of the spirit over the brutal force… The Knights won, and the winners are usually greeted with music… one supposes, it sounds triumphantly. L.G. 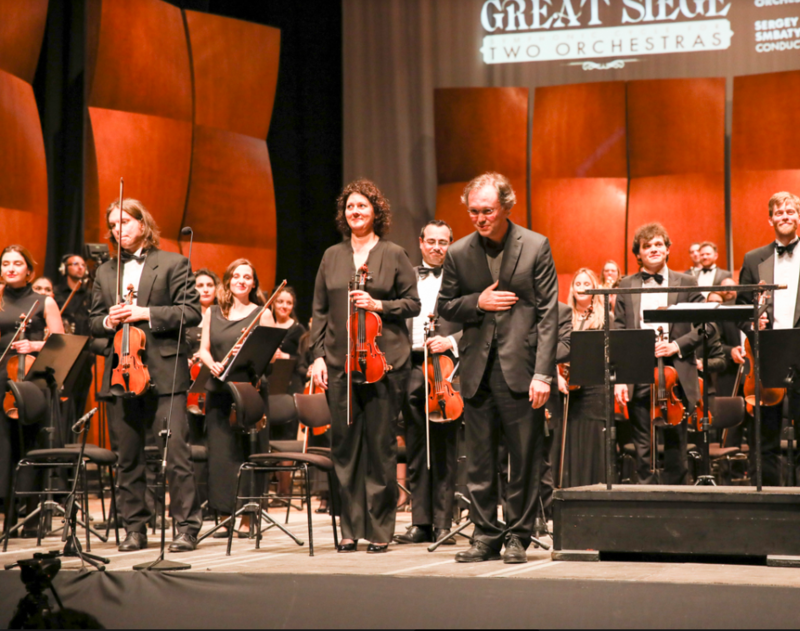 : I also liked that the score of the “Great Siege” is deeply touching, but yet optimistic. In addition, there are plenty of lovely melodies one wishes to listen to out of any war context, just for pleasure. And finally, I would like to remind you that tomorrow we expect the Maltese premiere of Shor’s Travel Notebook.